I bought some wooden toy wheels earlier in the week, two standard, and two spoked, both 50mm. Yesterday, using a 5mm balsa dowel, a brass cup hook (which I bent into the shape I like my hooks to be) and a mini hacksaw, I made a spindle using one of the spoked wheels. It weighs 15g, the shaft is just under 20cm and it spins beautifully and the yarn is very fine. The fibre above is from Maude & Me in the Kenya colourway. 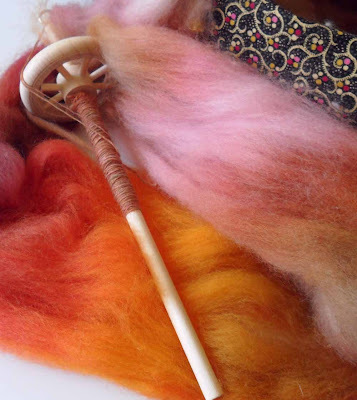 I have 60g of the fibre, and I'm making a 3ply laceweight. 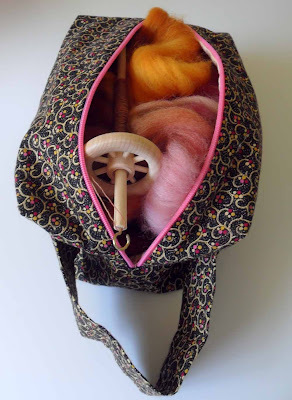 Best of all, the spindle, along with 20g of fibre, fits into one of my box project bags. Wonderful colors! 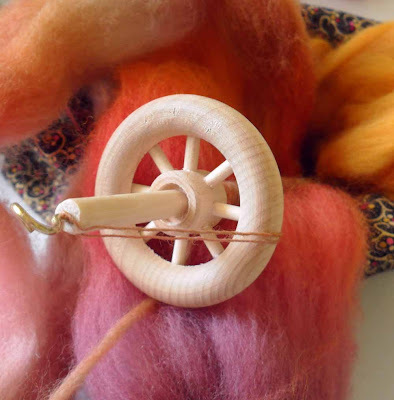 I need to try out my spindle some day! ^.^ Did you make that box bag? Lovely! Thanks Madeleine :) Yes, I made the box bag...using some of my favourite 19th century reproduction prints. oooh that's just gorgeous! love those colors.